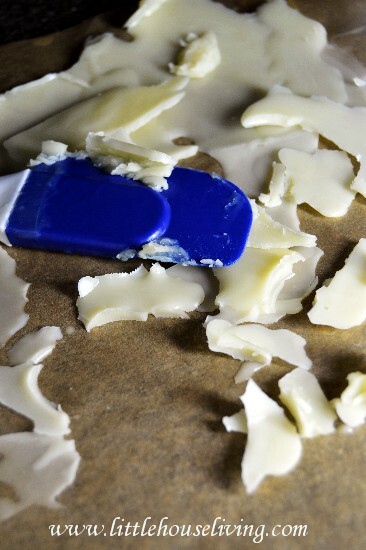 Homemade Lotion Bars are a simple way to apply a wonderfully creamy lotion to your skin without having to get the lotion all over your hands. Lotion Bars provide a thick lotion that is perfect for moisturizing dry skin. I can’t wait to share our tried and true DIY Lotion Bars recipe with you today! In our home, eczema, allergies, and asthma are something we have to deal with on a day to day basis. We all suffer from food and environmental allergies. I suffer from asthma, and my son and I both get eczema. But little Farmer Boy definitely gets it worse than I do. As long as I’m eating right my skin will stay fine, but he seems to struggle with it badly every day. We’ve tried every store lotion that the doctors have recommended and even some prescription lotions that were so strong I didn’t even want to touch them, but nothing worked for him. Finally one day I grabbed one of my homemade Lotion Bars and tried it on his skin. The next day it seemed like his skin actually had a little moisture in it and I thought it looked a little better so we continued to use it. Amazing! After going through months of trying everything we could, the answer was right there on my bathroom shelf! While his eczema still isn’t fully cleared up, we know what we can do to help his skin now and I like that I have all the ingredients on hand. Here’s how you make our little homemade Lotion Bars. Before we get started, make sure to learn about the best kinds of Beeswax, Shea Butter, and Coconut Oil you can purchase for projects like this. A good virgin coconut oil is key in this lotion because it has so many natural healing properties. I’ve noticed with most homemade Lotion Bar recipes I’ve found, people make them with soap molds. There is nothing wrong with doing that if you prefer a bar style lotion, but I’m one of those weird people that does not like lotion on my hands. So when I found these empty deodorant containers on Amazon I thought I had hit the jackpot! 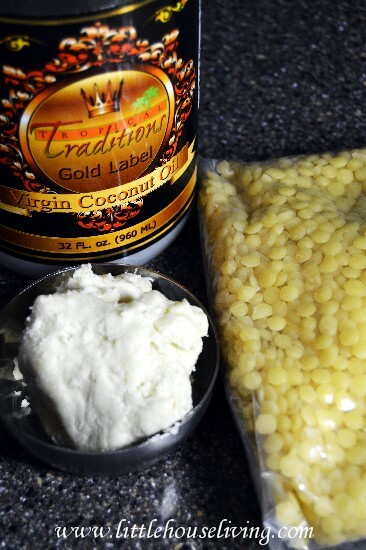 We love using these instead of making the traditional lotion bars. No lotion on your hands and you can apply directly where needed, which is very helpful for a squirmy toddler too! Plus you can reuse these when they are empty so you don’t have to keep buying more. As I said above, make sure you have a good virgin coconut oil to use in this recipe. Coconut Oil is known for it’s amazing antibacterial and healing properties, along with all of the natural vitamins and minerals it contains. All of the fatty acids it contains will also help with healing your skin, especially if you suffer from eczema like we do. I buy mine from Tropical Traditions, which I know is more expensive than some, but I like the way theirs is made. Start by measuring out your ingredients into a saucepan over a medium heat. I have a special old saucepan and spatula that I reserve just for making things like this so our food doesn’t taste like soap. Constantly stir the mixture. Keep stirring until it’s fully melted and no pieces remain. Usually it’s the shea butter that takes the longest to melt. 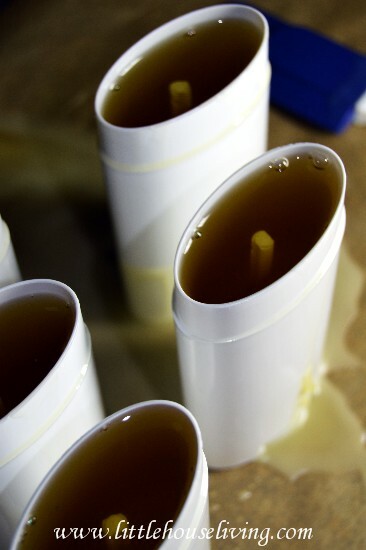 Pour the mixture into your soap molds or deodorant containers. Before I did this I laid down a piece of parchment paper to make any messes an easy cleanup. I’m really glad I did because I made a big mess with this batch! 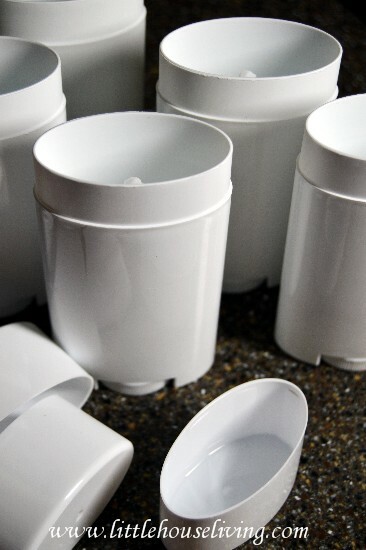 Let the lotion harden in the containers before you put the lids on and clean up any dripped lotion on the sides. If you live in a warm area you may want to store these containers in the fridge, otherwise, you can just keep them in a cool dark area. Homemade Lotion Bars will last for a very long time. And if you make a mess like I did, don’t throw it out! I scraped the pieces of lotion off the parchment paper and put them in a baggie. The next time I have an empty container I will just remelt these and fill it up. No waste! You don’t have to stop there! 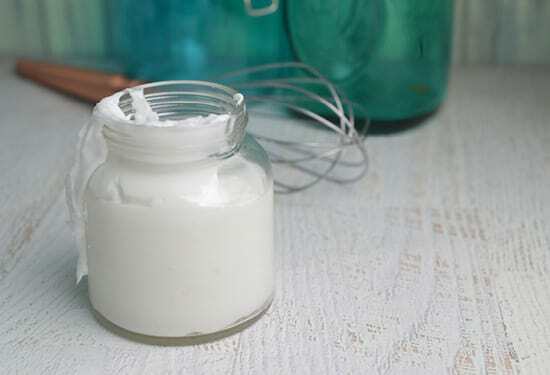 Here are some other great DIY Natural Homemade Body Products to try next! Of course, don’t forget to check out the DIY and Make Your Own page here on Little House Living for even more projects! 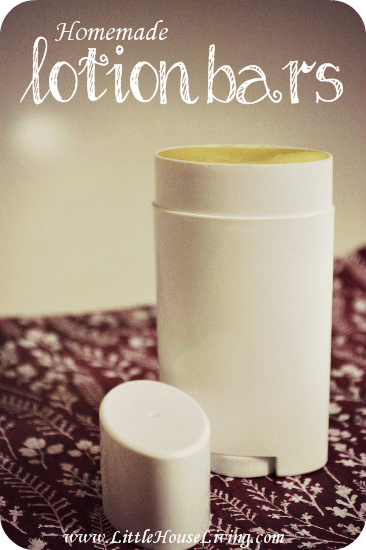 Have you ever made homemade Lotion Bars or any kind of homemade lotion? Share your tips and tricks! What a great idea. I have never thought about making my own lotion, but I probably should. We have a lot of allergies in this house and I would be able to make sure there is nothing in the lotion that would bother anyone. Great idea with the deodorant containers. I’ve ordered a couple different kinds from different sellers on Amazon and they’ve all worked well for me. I usually go with the ones with a bunch of reviews though to be safe. Okay, now I realize that the pellets are beeswax! Lol, I still have the seller question. Thanks for sharing the recipe and the links for the empty containers. 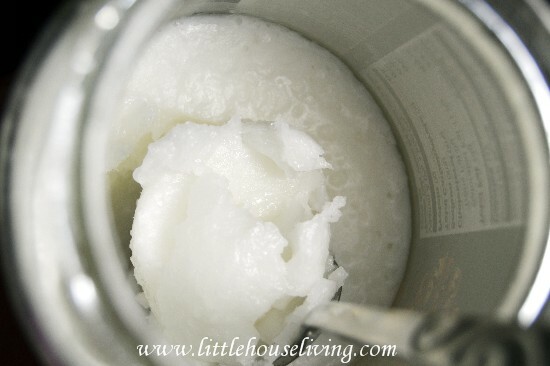 I’ve used just coconut oil but it is nice to see how to make a real lotion. And I agree, I don’t like having lotion on my fingers so I’m really happy to see the containers. I’m glad I”m not the only one that feels that way! This sounds like a great combo of ingredients, but I have never heard of a lotion “bar.” It almost sounds like it would be painfully hard on sensitive skin as you rub it with the hard surface. So it’s a bit soft like solid deoderant? What is the advantage to a bar over a more liquid lotion? Could you use it like a bar of soap with water? Thanks! You use this as you would if you were to take a stick of deodorant and rub it over dry areas. It’s not a hard bar like soap but very soft (so that’s why you need to keep it in the fridge if you live in a really warm area, it will melt!) It kind of melts onto your skin. Is there a was to add different natural scents to this? 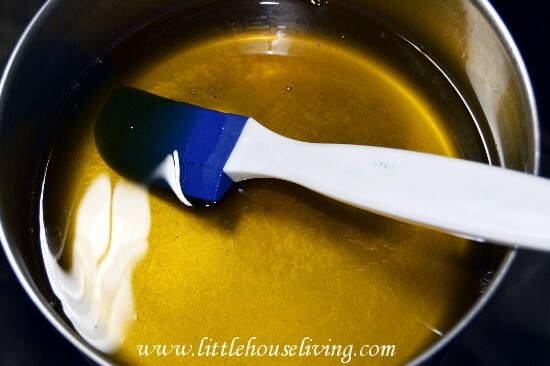 You would just add a few drops of essential oil to the mixture after it has melted. Just make sure any scents you want to use are “skin friendly” ie: no citrus, ect. I love lotion bars. Have made them for a couple of years and they work great for dry cracked feet. I will have to look into the deodorant containers. That really sounds convenient. Thanks for all your tips and recipes. Love your blog. Love this! I’ve always wanted to make my own lotion. This lotion bar looks so easy, I think I finally have the courage to go ahead and try it. This looks like a really great recipe! I was wondering. Do you have a recipe that would be good for dry scalp? My scalp is always itchy and flaky. It doesn’t matter if I use regular shampoo or dandruff shampoo and sometimes I’ll put conditioner right on my scalp. It’s always itchy! Do you think a recipe like this would be good for my scalp? I don’t have a recipe for that yet but I really need to work on it, mine gets so dry in the winter too. You can use the virgin coconut oil. Do a google search for coconut oil uses… and you will find that this is certainly a hidden treasure trove of amazing uses for medical conditions. I also read that Jojoba oil is really good for dry scalp. I love that these use all natural ingredients. Perfect for those with sensitive skin. You could add essential oils for scent, and for their healing properties. One I would seriously consider for someone with eczema is Rose. It only takes a few drops per jar or roller bottle is all you need. Wonderful for rosacea and uneven skin tone! Rose is antiviral, antiseptic, antibacterial, anti-inflammatory, soothing, hydrating, with emotional balancing properties. Rose is precious! These would make wonderful gifts. If I were to use the deodorant containers, how many does your recipe make? It should fill up 6 deodorant containers. Do you know of an alternative to the beeswax? I am, strangely, allergic to it. I’m not sure about oa sub for this recipe since beeswax helps make it hard enough to be in a “bar or stick” shape. I have fought skin issues since I was little and a little over six months ago I completely stopped using lotions and just use straight coconut oil. My skin has healed up completely and I only have to use it once ever one to two weeks to keep it that way! I love coconut oil! I have never used lotion bars they sound great. I am thinking they would be good as Christmas presents. Can you please let me know approximately how much liquid the recipe will make? If I get soap molds or use the deodorant containers I am wondering how many I will need? Thank you for your help. This recipe filled a little more than 5 empty deodorant containers, I had a little extra that I put in another small container too so I’m sure it would actually fill 6 containers. Thia is excellent. I dropped out of surgical tech school because of alegies. The Dr’s thought it was the strong soap….not sor. It was the lotions I used and the lotions and creams they were prescribing. I am allergic to the parabens. So basically what they were prescribing was causing my hands to peel, swell up, crack and bleed. It took months to heal. 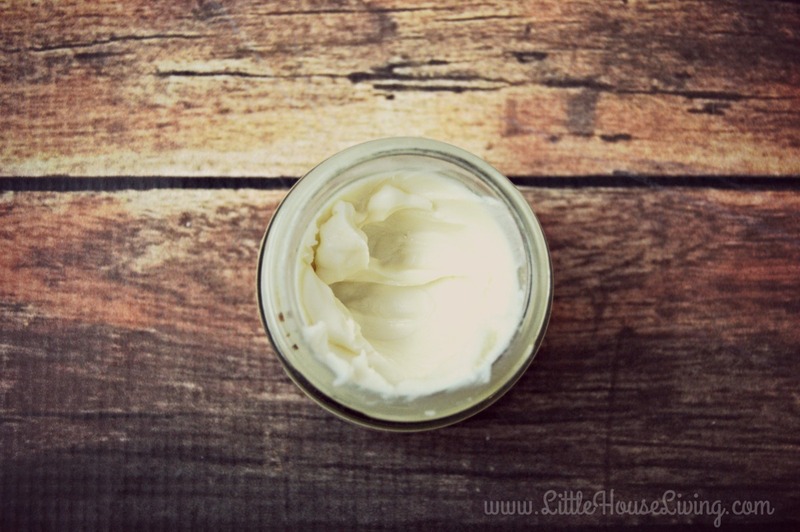 I made my own cream out of Crisco, Aloe and shae butter….This sounds GREAT. I am so excited to try this! We have super dry skin, and we live in the desert… so I am constantly looking for safe homemade lotions. The deodorant container is a great idea! I am slowly moving over to all natural skincare and I’m enjoying the process. I really appreciate that you have taken the time to write this out for us on your blog. When we were your age we moved into a farm house that was very old and no one had lived in it for the previous 5 years. We loved it because we could truly say that it was ours. It will be lovely to work together as a family build it into your own little dream home. I will look on from the other side of the world as you tell us of you adventures through this blog and will be wishing all the the very best. Interesting thought only because I struggled with excema for a LONG time.. I’m allergic to all dairy products… as soon as I quit drinking store-bought dairy products, my excema went away. 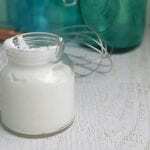 Great idea for homemade lotion. Any homemade hair products you’ve used? I’ve ordered the deodorant forms, but couldn’t wait. So I used the recipe with little jars; it seemed to come out too beeswax-y and not emollient enough. I’m at a high altitude, could this be the problem? Either way, I just remelted and added more coconut oil, plus small amount of organic sweet almond oil. Its cooling now. Fingers crossed! 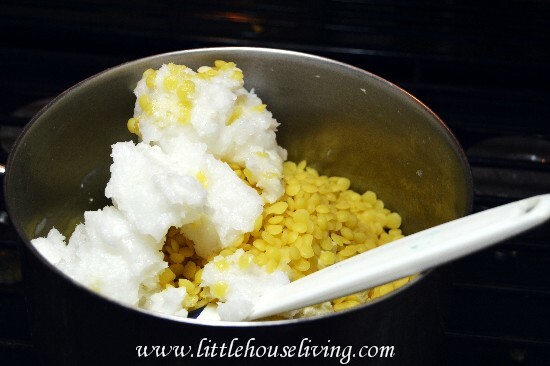 I added the extra beeswax in this recipe specially for the deodorant forms or soap forms because it makes it a little more firm. If you wanted it to be more like a regular hand lotion it should work to add a little more coconut oil and a little less beeswax. Well, the result is in! After adding more coconut oil and the almond oil, it has the texture of a salve. It is working serious magic on my chapped hands and rough cuticles, and is going into a care package to my son with eczema who’s on military deployment in the Sea of Japan. I think will go in my gift baskets for Christmas, as well; maybe with a little essential oil, and when the deodorant forms come I’ll dial up the beeswax again. This is a great recipe! Awesome! I’m so glad it worked and thanks for coming back to share! I’m very interested in trying this recipe as my husband and I are slowly moving to more homemade bath & body products. How much extra coconut oil etc. did you add to get the salve consistency? They look like they cooled too quickly and sunk in the middle. You can prevent or lessen this in the future by bunching them all together and putting a rolled up towel around the bunch. I’d likely put a tea towel over the top if I could keep it out of the product. I do this with my beeswax candles to keep them from sinking. Best wishes. I will definitely try this. I usually use a simple scrub of sugar and olive oil (which works miracles) but it leaves the shower slick. Wash up as normal, then scoop out of a jar and scrub on, rinse off. It feels amazing scratching the itch but is a bit hazardous from a slippery floor! I’ll have to give this a try this winter, especially with a toddler boy! 🙂 thanks for sharing! Great idea for the dry winter months! Any idea about how much these cost to make per stick? Thanks! Probably around $1 to $2 per stick, not including the container. We have used just beeswax, virgin coconut oil and a little olive oil for years now. Works great! I am wondering if there is a substitute for coconut oil. My husband is allergic to coconut. We try not to buy products that have the oil or other forms of coconut in them. This recipe makes enough to make 6 containers and it barely made a dent in my supplies. You may be able to get away with one package of each thing (maybe 2 packages of shea butter if you get the 8 oz). I don’t use essential oils in these since we use them for sensitive skin but I would think a drop or two would work depending on the size of the batch you are making. I personally would not put this recipe in a little tin, it’s a hard lotion and would be difficult to get out. Another option that would be a little prettier would be to pour the lotion into soap bar molds and then you can place those in some kind of tin or container after they have set. I hope that helps! Oh man. I thought I was the only one who don’t like getting lotion on my hands. I know I have to do this to apply my lotion but afterwards when I need to put my hands on something that greasy feel getting on things.. I am trying this recipe right now. I reduce the amount of beeswax, shea butter, & olive oil b/c I only have 5 deodorant containers and this recipe calls for 6 containers. I put 1/4 of each ingredient(4tbsps) in a styrofoam bowl and into my microwave. I don’t have anything I can melt this in that I don’t want to clean so I chose the styrofoam bowl and neatly poured it in my containers. It makes 1.5 bottles. So when it cools I’ll be ready to use it. Will recap on how it turned out for me. I’m looking forward to hearing how you like it. I’m glad I’m not the only one that doesn’t like lotion on my hands! Any other ingrediant I could use besides shea butter? My son is allergic to nuts so that wouldn’t work. But also has skin issues and he might actually use this. I’ve made a similar recipe using equal parts beeswax, coconut oil and cocoa butter, with some Vitamin E oil and other essential oils for scent (Lavender, vanilla,etc). I was very happy with the results, as were the people who got some as gifts. I purchased a pack of little plastic hearts at Dollar Tree and used a mini cupcake liner inside…used about 2 tablespoons per “bar”. I made a batch of these today. They are heavenly! I am pretty new to all this and allergic to natural bee’s wax. What would you suggest as an alternative? I made these bars and gave two away as Christmas presents. WOW….whadda big hit they were. I added orange and clove oil for a wintery smell. Next time i make some i’m going to use some lime and maybe a little vanilla or maybe some mint added and i want one with grapefruit oil. I use this bar on my body, hands, face. I love it. I had a big scratch on my leg and the lotion bar was very soothing. I had a couple questions for you. Is the pellets or shaved beeswax better, is there a difference? And does it matter bleached or unbleached? For the Shea butter does it make a difference if you used the raw unrefined or not? My sister is a med aide and allergic to the latex gloves they have at her job. I wanted to make her some of this to put on her hands. She comes home with them all raw and cracking/bleeding from the latex. The company has non-latex gloves on order but she needs some relief in the meantime. You say you and your son suffer from eczema. My daughter does as well. We had her on medication prescribed by a dermatologist, but it wasn’t really fixing the issue, just helping the effects of it. I started researching it eczema and it’s causes, and if there was a home remedy for it. I came across an Apple cider vinegar cure. My daughter started taking it and within less than an hour the itchyness stopped. It is worth a try! My daughter has been taking it for sometime now and hers hasn’t come back. Give it a mix and wait for the fizzing to stop and then drink it down. I had to have a strong fruit juce to follow as my daughter didn’t like the taste. Do you have any recommendations to use in place of coconut oil? My daughter’s allergic to it. Thank you. I haven’t used anything yet besides coconut oil but you may have luck with jojoba or almond oil. I’m trying to decide which brand of beeswax to buy and a lot of the reviews have complaints about a bad smell. Can you tell me which brand you bought and if you had any problems with smell? I noticed that too on the comments, it looks like the last one I bought isn’t available now…but I think many people are under the impression that beeswax should smell like honey and it doesn’t, it’s got it’s own distinct scent. THIS kind looks like the more recent reviews are pretty good. 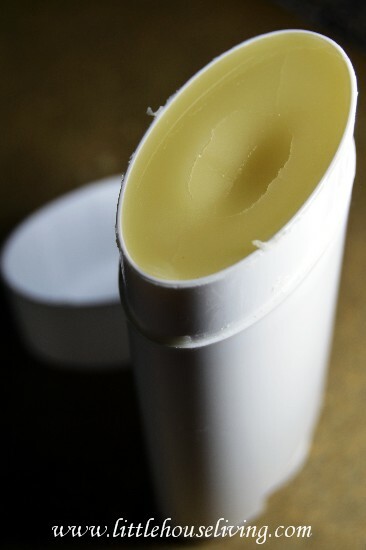 When making lotion bars how do you fill the deodorant tubes . What stops the hot mix from running out the bottom ??? There is a push up plastic section in the middle of the deodorant tubes that keeps everything in. I simply pour the mixture straight from the pan. I purchased them off Amazon, they have a decent selection if you search lip balm containers. 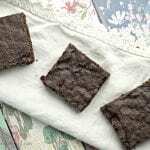 I found your page through Pinterest and just wanted to say thank you for sharing this recipe! I mixed up a mini-batch (one container’s worth) of this lotion bar and I’m obsessed with it now! Putting it in the deodorant dispenser is pure genius! I used it right out of the shower and loved how I could fully moisturize and didn’t have greasy hands at the end of it all. I’ve been using different oils to moisturize for the last few years, but always had to be careful touching my hair or putting my contacts in, so your bar is just so awesome! My 4yo loved it too because he could do it all by himself and I didn’t have to worry about a mess. I even put it on my face before bed. I use a similar recipe for body butter. I add almond oil & castor oil about 1tbl each to the batch. I let it cool until I canot see the bottom of the pan. Then I whip the mixture with electric whisk. I place the buttery mixture into glass jars. Wonderful for dry cracked skin any where on the body. Do you have to use the Virgin Coconut Oil, I ask this question as I currently have the regular Coconut Oil for making my hot process soap. You can use either coconut oil in this recipe. The only reason I used extra virgin is because it is less processed than the expeller pressed version so it helps skin with extra dryness and eczema. Thanks for getting back to me, I will be making these lotion bars for our 22nd annual Mother’s Day Brunch!!! What essential oils do you suggest for the lotion? Would using fragrance oils also work with this product? I think I read in a earlier comment that using citrus oils is not good to use for the lotion bars, if so what oils/fragrances do you suggest to use. I am so very excited to try this recipe! I have everything on hand already and I will be making them tomorrow! Thanks a bunch for linking upat Get Schooled Saturday, and I will be featuring you on Friday! I am now following you all over the place so I don’t miss out on any of your awesome goodies! I’ve pinned this awesomeness! I am thrilled to find an easy recipe for sticks because I too hate to have lotion all over my hands when its not my hands I’m trying to lotion up. This is perfect and I can’t wait to buy all the stuff and start a batch. If all goes well I know just what I’ll be putting in everyones Christmas baskets this year! I’m so making this!! Pinning it! I hope you try it and are able to use and enjoy it! I made this and absolutely love it!! Thank you so much for sharing. I added a dash of zinc oxide to a batch to make it a stronger SPF (I believe coconut oil is already 10 SPF). Thank you, thank you, thank you! 😀 My skin is soft, no more dry spots, and I smell like sweet honey all day (I use less processed beeswax, as I love the honey scent)! I’m glad to hear that this has helped your son’s skin, I used to get eczema and it was horrible. Natural remedy’s are always the best. Thanks for linking up to Sweet and Savoury Sunday, stop by and link up again. Have a great day!! This is the best way to apply coconut oil! I make a variation of this for my lotion bars. I use one part beeswax, 1 part of butter (shea/cocoa combo that adds up to one part) and 1 part CO. However, I was in a hurry this morning to make more and I accidentally used: 1.5 cups of beeswax, 1 cup of Cocoa butter, 1 cup of Shea Butter and 1 cup of Coconut Oil….which means there is more of the butter than of beeswax or even coconut. They aren’t in equal amounts anymore. I put them in the fridge to harden but now I’m thinking I might have to melt again and add beeswax because they might be too soft? What are your thoughts? Do I need to redo my batch? I found a silicone mold at JoAnn Etc. that has 24 small cavities, each one round with scalloped (sort of) edges. I used this to make mini-lotion bars and made 100 of them for favors for a baby shower. They were a big hit. I don’t think each one was more than 1 oz. and because the mold had so many cavities the making went very quickly. I found a scent called “baby powder” (don’t remember where now) and used that for the lotion bars and for soaps I made for the shower. Thanks for sharing the recipe on how to make these. 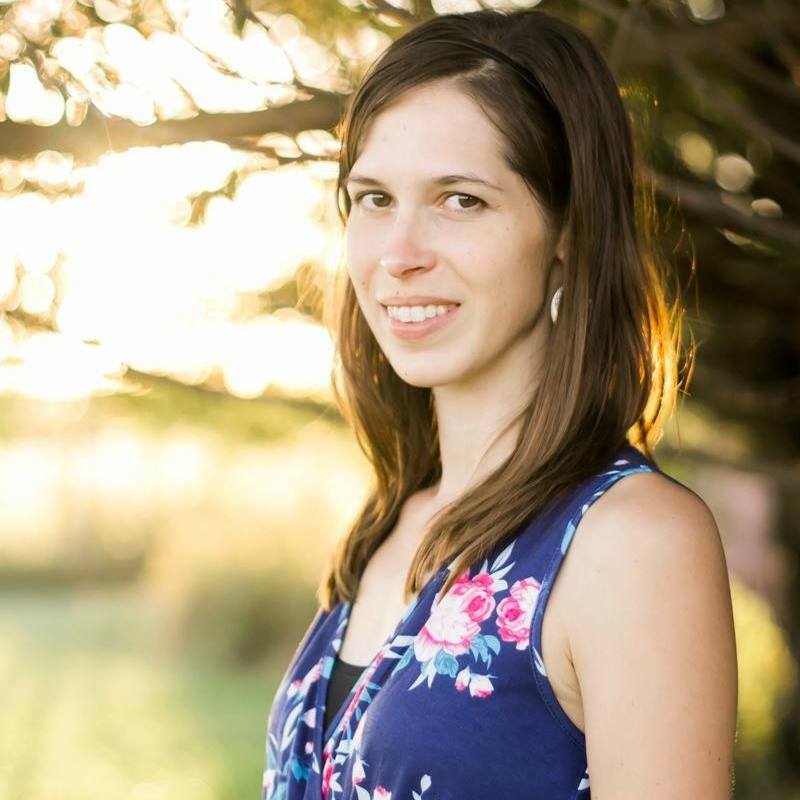 Stopping by from Motivation Monday link up. LOVE this project! Homemade beauty items are the BEST!! We featured you at the Project Stash so stop by to grab your featured button & link up your latest creation(s)! Have you looked into allergies causing the eczema? I have an allergy to isothiazolinone mix and my eczema/psoriasis has resolved since i started avoiding this chemical, and making my own soaps, lotions, hair products, cleansers. Apparently about 1 in 10 people have this allergy as its’ use is becoming more widespread in many different products. This recipe looks great! So I will have to try this. I am all prepared to make these bars. I have ordered everything from Amazon and even picked up an old pot from goodwill. I would like to add comfrey and calendula oils to aid with my toddler’s eczema. Any suggestions as to how much of each oil I should add? 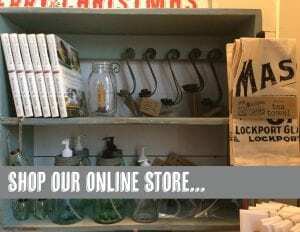 LOVE your website- may be slightly addicted to your posts! Thanks! I haven’t add those oils so I’m not sure but I wouldn’t add more than a few drops per container that you are making. Hi, I was looking for instructions on how to make dolls made of yarn and i stumbled upon your website and happily discovered this lotion bar recipe. It is the simplest one I’ve found and will try it as soon as i can get a hold of soap molds or deodorant molds. My son has eczema that act up whenever he eats too much sweet (i’ve recently discovered as he started daycare a few months ago) the your ingredients are the exact ones i use on his skin. Thanks for this recipe. My daughter and I made these this weekend and it turned out great! 3 simple ingredients. Plus love, of course. This sounds amazing thank you! Our youngest has asthma, his Dr said it’s very important to keep his skin moisturized. We use a very creamy OTC lotion, it works well, But I have a heck of a time rubbing it into his skin, so my husband has to do it. Since he’s getting older now, these would be amazing for him to use himself. Do these have a scent from the cocoa butter? I’d prefer something scentless, but if he does it himself, I’m sure it’ll be fine. Thanks so much! I ordered my containers today, hubby is picking me up beeswax & shea butter tomorrow. I’m so excited to make some!! Yay! I hope you enjoy making them and using them! Got the containers today, yay! Just a few more questions, when you first got the containers, did you sterilize them before you used them, if so, how? I was just going to boil them or if not boil, then put them in water that was boiled & leave them in there for like 5-15 min? Hubby got me a bar of beeswax, not pellets. It’s fine, I can grate it. But since it’s not in pellets, will it still be the right amount when I grate it? I know, I’m being weird, lol. I just want to do this right. Thank you!! I didn’t do anything to the containers before using. And yes, the amount will still be the same when you grate it. Have you tried cutting out dairy? Frequently this is the cause of eczema (additionally dairy makes regular sinus mucus worse). It might be worth a try. Meanwhile this lotion can be saved for just the dry skin that happens for the cold winters – I cannot wait to make some of this up! Our son is allergic to dairy so it’s not in his diet 🙂 We have learned that most of his eczema comes from an allergy to a mold that is in the dirt.